History relates how important wool was to the economy of England and the West Country. One benefit still visible to-day are the many of our village churches. In the nineteenth century Winsham had its own woollen cloth factory, said to be four stories high. Small farms dotted the Parish and many made butter, cheese and bread. Many workers would have kept a pig or poultry in a garden or small orchard and in the past these woul d have been used for subsistence ,with any surplus being used for barter or sold. It was important that farmers could readily sell their produce, so local markets were vital . There were markets at Chard and Crewkerne. In the twentieth century, milk had to be taken to the 'Milk Factory' at Chaffcombe. (This was to became a cider factory -Bert Rogers' 'Bottled Sunshine'). It is now a Municipal refuse dump. Eggs were collected by the packing station (Salter & Stokes) at Chard Junction. Timber was taken to the 'Yonder Hills Saw Mills', the other side of the Axe River and railway line, situated near to J.R. Pratt's Quarry and Fowler's Feed Mill. 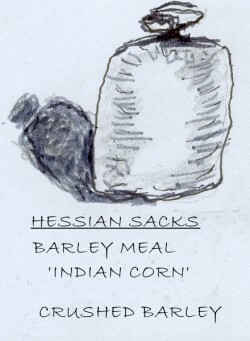 There was a market for grain (wheat, oats and some barley) operated mainly by Bradford's and the Chard Trading Company. With the aid of older Villagers who were involved with farming, we can get a fairly accurate picture of farm life from almost the turn of the last century (1900 onwards). Whilst each farm would vary according to individual circumstances - there are 27 marked on the map (fig 1) -here is a snapshot of a typical Winsham farm over that period. It would be rented. The size of such a farm might be around 130acres.This would include 20 acres of woodland (including coppice, covers and shelter belts), and 20 acres of arable,30 acres for grazing (steep, wet or watered), and 50 acres for hay. The people living and working on the farm would be the Farmer (and family) and four men (milker, carter and two labourers). 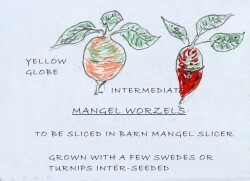 There would be extra seasonal helpers as required (hoeing, haymaking, harvesting, muck-spreading, apple picking). 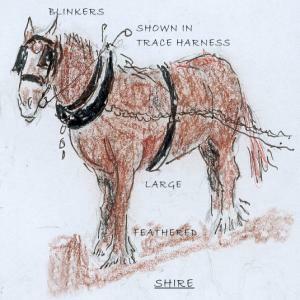 About six miles of hedges would exist on the farm - needing to be laid every seven years -some stretches were let out to old men in exchange for the tops (stakes, spar-gads, spars and faggots). 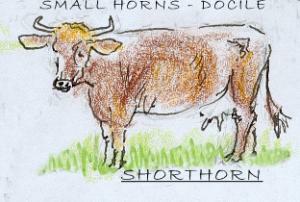 (a) 15 Milkers (mostly dual-purpose Shorthorn). (b) (10 young cattle as replacements). (c) 10 grazing bullocks, (south or north Devon). 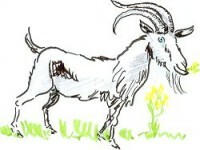 Goats could eat poisonous weeds! 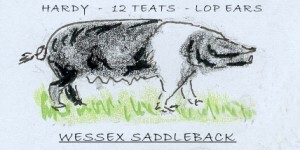 The Wessex Saddleback was a hardy grazing pig . Five sows and their offspring (crossed with a Middle or large boar to give a 'blue' hybrid bacon carcass. 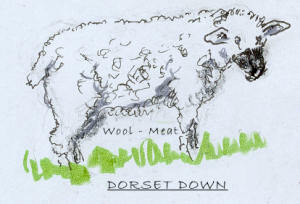 A small flock of Dorset Down ewes would be kept for wool and meat production. A goat would be kept to eat poisonous weeds. A small flock of Dorset Down ewes were kept for wool & meat production. A goat was also kept to eat weeds that were poisonous to other grazing animals. Free-range hens run with a few cockerels. 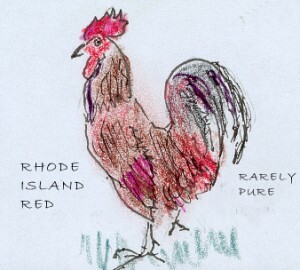 Usually derived from Leghorn or Rhode Island Red (eggs) or Light Sussex (meat). As people were often given odd Bantams, Barnivelders or other breeds, the resulting flock was very colourful. One farm even had Anconas. Ducks were either Khaki Campbell (eggs) or Aylesbury (meat). Often a few Geese and Turkeys would mingle with Galaneas (Guinea fowl).